Julia Christian is a forest governance campaigner focusing on West Africa at Fern, a forests and rights NGO. Its sweet taste, pleasure-inducing chemicals and forbidden aura make chocolate an enormously popular Valentine’s gift. So sales will peak this week in a global industry estimated at around $100 billion annually. But before you rush off to buy chocolate as a last-minute present for a loved one, you might want to pause to think about where it comes from. Most of the world’s cocoa comes from two small West African countries: Cote d’Ivoire (40%) and Ghana (20%). Western Europe, meanwhile, leads the world in devouring it – with the Swiss, Germans, Irish and British heading the chocolate eating charts. The average Brit, for instance, eats 7.4kg of chocolate a year: about a tenth of their body weight. 60% of global cocoa bean imports come to the EU. But the cost of this consumption to the places producing it is extraordinary. There is cocoa’s devastating impact on rainforests, for a start. Since 1990, Cote d’Ivoire has lost 85% of the lush tropical forests that used to blanket the country, thanks to cocoa production. Ghana and Cote d’Ivoire are at the edges of the Sahel desert, and vulnerable to creeping desertification that gets worse every year because of climate change. When trees are cut down to grow cocoa, the rich soils and rains that the forests bring start to disappear— making agriculture more and more precarious. As we feed our insatiable appetite for chocolate, millions of rural West Africans’ very survival is put at risk. What’s more, much of this deforestation occurs in national parks and other supposedly protected areas – home to nearly 6,000 plant and animal species, including some of the last refuges of the threatened chimpanzee. The invasion of state-owned protected areas has been closely tied to illegality. An estimated 35 to 40% of the Cote d’Ivoire’s cocoa production – 60% of which goes to the EU – is produced on illegally converted land. Similar pressures have been at work in neighbouring Ghana, which stands to lose all of its remaining forests outside its national parks in the next decade, according to a study by the US NGO Mighty Earth. The environmental impact of cocoa is mirrored by the human suffering which blights the sector. Some 90% of cocoa producers are smallholders. Many live in abject poverty. In Cote d’Ivoire they earn around 50 US cents a day and in Ghana around 84 cents. The UN defines “extreme poverty” as earning below $1.90. The injustice of this is compounded by how little of the chocolate industry’s $100 billion global annual profit finds its way into the farmers’ hands: on average a cocoa farmer receives 6% of the final sale price of a chocolate bar, while retailers and chocolate makers keep 80% of the sale price. Intimately linked to this is the problem of child labour. 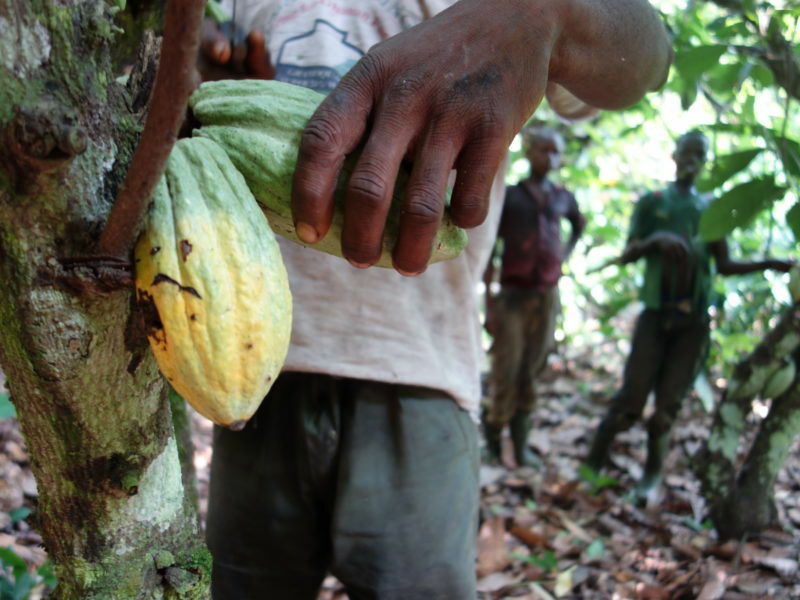 More than two million children in West Africa work in the cocoa sector, many of them in dangerous, taxing conditions. The situation in West Africa provides a cautionary tale for other nations where – as demand for chocolate continues to grow – the industry is spreading its tentacles. Research released today by Mighty Earth shows that cocoa is starting to decimate forests far beyond Ghana and Cote d’Ivoire: using mapping and other data, they found a striking correlation between large-scale deforestation and the cocoa producing regions of Indonesia, Cameroon, Peru and Ecuador. But the solution isn’t to end our cocoa trade with these countries – further impoverishing smallholder farmers – but to dramatically reform it. As the number one importer, manufacturer and consumer of chocolate, the European Union has both the responsibility and the power to do so. The EU has already regulated supply chains on conflict minerals and on illegal timber and fishing. 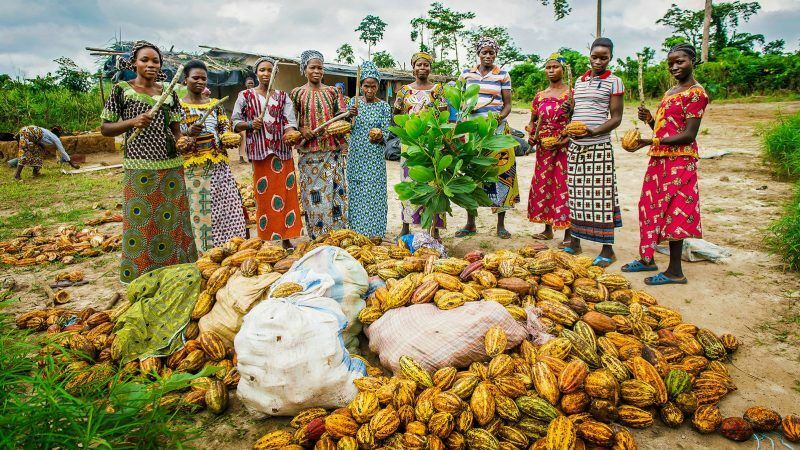 As matter of urgency, it should do the same for cocoa, legislating to ensure that all cocoa entering the EU is free from deforestation and child labour, and that more of the profits go to those who are doing most of the work. If it does so, it could make our Valentine’s day chocolate indulgence a truly guilt-free experience.